Chrysler recently introduced at the 14th Annual Woodward Dream Cruise the limited Edition 2009 Chrysler PT Cruiser Series 5 model. 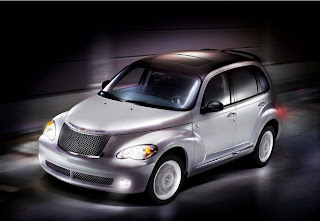 The PT Cruiser series 5 comes in two fuel-efficient engines. The standard 2.4 liter, 16 valve engine which produces 150 horsepower and 165 lb. of torque and comes with a four speed automatic transmission and a 2.4 liter engine with a 180 horsepower engine which can produce 210 lb. of torque. 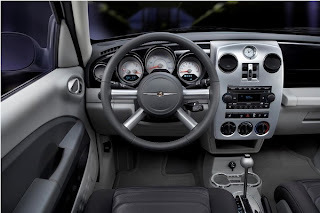 The 2009 Chrysler PT Dream Cruiser Series 5 model features new design elements such as a brilliant black crystal pearl painted roof and hoop spoiler. There's also a new cross-hatched, lower and uppoer solid billet aluminum grilles which is individually milled and machined. For those like me, who's never really into wordey description, here's some photos for you to peruse. 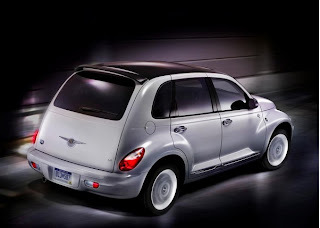 Chrysler set production for the PT Cruiser only at 1,750 units which will retail for $22,700. Can't wait for this baby to hit the used cars for sale market though I'm not getting my hopes up. Speaking of which, if you're looking to rate some cars, head on over to www.auto123.com and rate your car and you can win a free vacation.